Follow this simple step-by-step guide to resetting your account password. Click "Login" on the top right corner of the page. 2. Click "Reset your password"
4. You will receive an email to confirm your request to reset your password. To confirm this request, simply click the link within the email (please see step 5 if you are unable to click the link). This is for additional security reasons to ensure no one else can reset your password. Highlight the text starting with 'http' through to the last digits, in the example below these are '1553'. Then right-click your mouse, select 'Copy'. 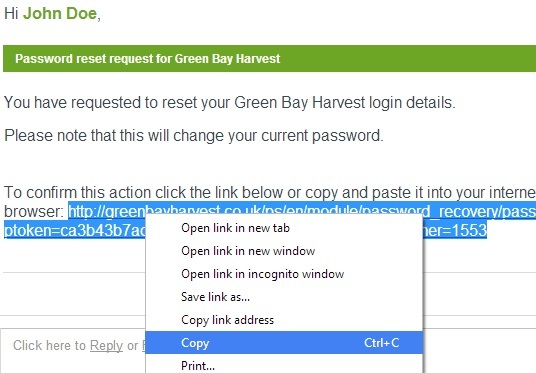 Then open a new tab or window in your internet browser, right-click again and select 'Paste'. Then, press Enter on your keyboard. 6. After clicking the link (or copying and pasting it and pressing enter) you will be redirected to our website to reset your password. 7.Enter your new password and click 'Save'. Note: Passwords are case sensitive. 7. Success! You will now be able to use your new password to access your account. 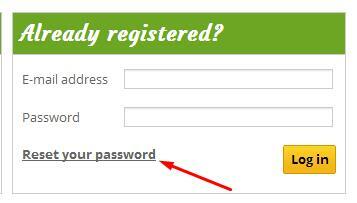 Return to the "Login" page, enter your email address and new password, then click "Log in". 9. You're now ready to shop!